I should have known it. My tour of the most fortified border on the planet would be cancelled. Well, I showed up at the USO office (right across from Yongsan Garrison) and the bus was there, along with about 20 other people. So far so good. We boarded and shipped out of Seoul, barreling up the highway north of the city. Immediately to the west of the highway stretched an endless barbwire fence, though this was no official borderland. Even within the territory of South Korea they have to fence off and guard the Han River from North Korean (NK) mini submarines and amphibious landings. Every 10 feet or so there is a white rock lodged in the fence. A missing or fallen rock would alert Republic of Korea (ROK) forces that the fence has been tampered with. After about an hour we pulled up to the gate of Camp Bonifas, UN Joint Security Area headquarters. The Camp is the gateway to Panmunjom, where some meeting houses and an official North Korean building on the other side of the border are the only occupied structures in the 240km long DMZ (Demilitarized Zone). I really wanted to get a look not only at the standoff of soldiers but the standoff of buildings. Our USO tour guide, a quirky little Korean man, hopped off the bus to summon the US Army soldier who would be guiding us through the compound to the border. Our guide was gone too long. He came back with a long face. I knew it. The North and South were conducting unannounced "military talks" and we would not be getting on Camp Bonifas. Silly military talks, I wanna see me some NK soldiers! Senseless satellite launch, I want my Disneyland Military Zoo! But all was not lost. We drove up a hill to the Dorasan Observatory, a little outpost with a long row of binoculars that on a clear day affords views of up to 20km into North Korea. That morning a thick fog lay over the 4km wide DMZ. 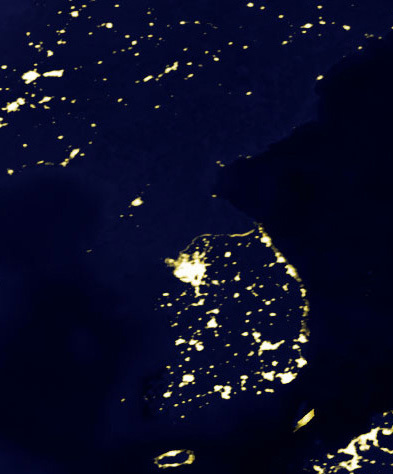 You could barely make out the North Korean border. I did, however, see the world's tallest flagpole. NK built its 160m flagpole after the ROK erected a 100m flagpole just across the border. Waving away in the distance, the flags didn't seem so big or intimidating. In fact, foreshortening makes the South Korean flag look about the same size as North Korea's. The other members of the tour group ambled around on the platform and the woeful souvenir shop (you can buy a piece of barbed wire from the DMZ encased in a glass frame--jumping the Berlin Wall gun a bit). We were then all called back to the bus. The only other site we could see on the scheduled tour was the 3rd infiltration tunnel, discovered in 1978, making real the fear of invasion. Now it's a heavily trafficked attraction. A hundred meters or so below ground, I walked where North Korea was digging away, preparing a secret tunnel that could move 30,000 soldiers into South Korea per hour. They let you get to within 170 meters of the military demarcation line. Three concrete barricades and a minefield between you and North Korea ensure that the tunnel is kept a tourist attraction. They've even installed a handicap inclined elevator. Good for them, I say; everyone should have the right to see a cool tunnel under DMZ. After the long haul out of the tunnel, we had to watch this terrible propaganda film. It started with a crying child walking through a wheat field. Ostensibly she was crying for the divided Koreas. The film rehashed the Korean War footage which I am totally sick of, and then it painted this joyful scene of the two leaders shaking hands in the early 2000's. You see images of serene "untouched nature" of the DMZ. (It is, like many military reserves, a very dangerous piece of "conserved" nature.) The film sang the successes of the opening of a kitchenware manufacturing plant owned by South Korea but using North Korean labor (think maquilidoras but on NK territory). Since the conservatives took power in the ROK last year, however, the production has dropped dramatically. The film ends with a CG butterfly dancing around the now happy girl. As if all were hanky-panky in the wonderful nature dream land of the DMZ. A week ago I was at a different observation point along the DMZ called the Odusan Unification Observatory with a similar long propaganda film which I will be sharing, at least in audio content, in my upcoming podcast. At Odusan I was amused by the scene of curious Koreans spying on their neighbors to the North. I had to do some snooping myself. I saw a North Korean farmer walk out of his house and into his back yard. Ooooh. I suppose for a South Korean that is a very exciting thing to see. After the gratuitous array of binoculars, you walk downstairs to a gift shop selling stuff from North Korea. Either speaking well for North Koreans or more likely for the South Korean demand, there was an impressive quantity of soju. This hubris is what I believe accounts for the hideousness of lot of the military and post-military architecture that I have seen in Korea. Beginning with the Speerian War Memorial of Korea, add the behemoth National Museum built on ceded military land at the south of Yongsan, the Odasan Observatory, and finally this train station. Stylistically they're not related, each coming from a different decade, but they are all products of the same mentality that if you build it big, "they" will be impressed. (The North Koreans, of course, aren't any better and of course pitiful for the example of Ryugyong Hotel). In spite of the hideousness or perhaps because of it, I am drawn to investigate more… I have just arrived in Tokyo to explore the US military presence here and the morphology of the city by military means. Will I be intentionally looking for hideous buildings and landscapes? Probably. It's so damn fun. If anyone reading this is in Tokyo and wants to get together, drop me a line! This is the freakiest/coolest thing ever. I have always wanted to go to the DMZ or even to see North Korea with my own eyes, which is a ridiculous thought. But really I imagine NK to be a lot like that flag pole war you talked about....I cannot imagine life in such an insular society. PS. Thanks for the food map, LOL. I visited the DMZ about a year and a half ago. Its something you just don't forget. Technically, I was on North Korean soil for a little bit where there is this tiny little blue building that straddles the border (it is monitored 24/7 by video and audio. In terms of "seeing" there isn't much, but you can feel the tension. If I remember correctly, the curved roof of that train station is supposed to represent two holding hands. I'm not into that kind of symbolism, but interesting anyway. The real tragedy is the separation of families. If I remember my statistics, it'll take thousands of years for them to reunite them all at the current pace and the average age of that generation is around 70? Oh, and don't even get me started on the numerous international humanitarian laws this goes against, not allowing families to contact each other. Who ENFORCES these BASIC humanitarian laws? dubK, if the threat of physical invasion is not as real, they still don't want to let their soldiers forget about it. I heard gunfire crackling off in the distance, likely coming from some ROK training camp. plus there was a troop of soldiers in the tunnel getting a quick history lesson. the food map I owe some credit to Kichul Lee, a Berkeley grad that I met up with and obviously a budding cartographer. 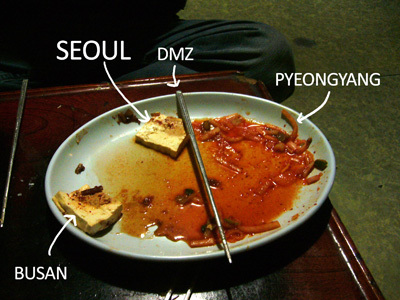 He ate Seoul, I ate Busan. Sl, that was the one moment in the film that I had a genuine feeling of any kind toward the whole mess, when they showed the reuniting families. They neglected to mention how many more are still separated. the NK/SK soldiers staring each other down is intimidating. but it was cool standing w/ one foot in each korea. fyi - the dmz is the #1 reason we'll never sign a land mine ban. it is the only thing short of nukes to slow the marauding north koreans if they ever decide to all out tear towards seoul. "Of the total, first generation members total 1.23 million, of which 690,000 are between 60 & 69 years of age; and 260,000 are 70 years of age or older" - 1996 figures based on figures from 1970. Including second and third generation, it would be around 7.67 million in the south alone. Every year they choose 200 family members to be reunited. Article 26: Each Party to the conflict shall facilitate enquiries made by members of families dispersed owing to the war, with the object of renewing contact with one another and of meeting, if possible. It shall encourage, in particular, the work of organizations engaged on this task provided they are acceptable to it and conform to its security regulations. I am not in Tokyo - but keep the blogs a comin' awesome read! They told me the tallest flagpole was the one in Abu Dhabi, near the breakwater! Yours looks like an Eiffel tower with a flag pole for a spire.